As long as we have Taiwan, the Communists can never win. Mao is a strange man whose personality is like the Tao, sometimes In sometime Young; he has a soft-as-cotton outer layer, but at the same time has sharp needles hiding inside... I do not think he could achieve anything, at the end he will be crushed inside my palm. If and when the war starts(WW2), no matter where or whoever you are or if you are young or old, Northner or Southner, you all have the responsibility of protecting our home and repelling the enemy, you all must have the will to achieve ultimate sacrifice. We must use every inch of our blood to take back every inch of our land, you ten thousand youths and soldiers. "It is not worth it to sacrifice the interest of the country for the sake of my son." Jay Taylor (2000). The Generalissimo's son: Chiang Ching-kuo and the revolutions in China and Taiwan. Harvard University Press. p. 59. ISBN 0674002873. Retrieved on 2010-06-28. Jonathan Fenby (2005). Chiang Kai Shek: China's Generalissimo and the Nation He Lost. Carroll & Graf Publishers. p. 205. ISBN 0786714840. Retrieved on 2010-06-28. "I would rather have no offspring than sacrifice our nation's interests." 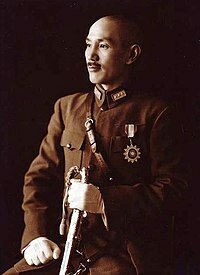 Chiang had absolutely no intention of stopping the war against the Communists. Jay Taylor (2000). The Generalissimo's son: Chiang Ching-kuo and the revolutions in China and Taiwan. Harvard University Press. p. 74. ISBN 0674002873. Retrieved on 2010-06-28. This page was last edited on 21 April 2019, at 22:33.